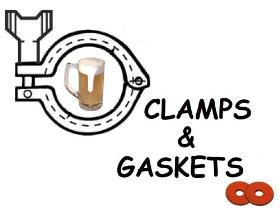 Clamps & Gaskets: News Roundup for Weeks 7/8, 2016. The Kansas Supreme Court rules arrests for refusal to submit to DUI breath or blood tests, without warrants, to be unconstitutional. In its 6-1 ruling, the court found that the tests were in effect searches. The U.S. Supreme Court is currently considering cases from other states on the same issue. President Obama nominates Carla D. Hayden, past president of American Library Association, to be the 14th Librarian of Congress. If confirmed, Hayden would be that post's first woman and first African-American. 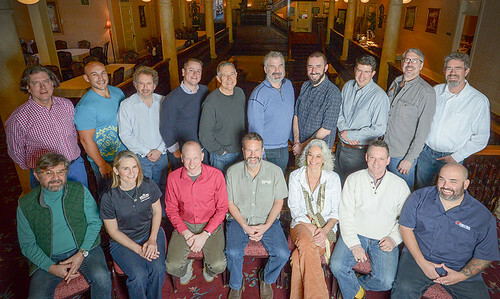 The [U.S.] Brewers Association seats its new Board of Directors for 2016. Rob Todd, president/founder of Allagash Brewing (Maine) elected chairman. Utah will allow national coffee-shop chain Starbucks to serve beer and wine in its shops in the state. But the liquor dispensing area — marvelously known as a Zion Curtain ­ — where alcohol is stored and dispensed, must be kept out of sight of customers. The evolution of beer blogs (and blogs, in general) versus that of social media (such as Facebook, Twitter, Instagram, etc. 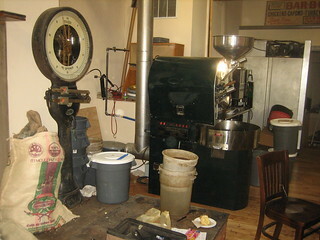 ), a decade ago versus now. Social media does a great job of recreating a virtual water cool; it's crap at recreating a virtual newspaper. Longer pieces, more thoughtful pieces, analytical pieces--these are what people now go to blogs for. —Via Jeff Alworth, commenting on a decade of blogging at Beervana. Two new studies published by Proceedings of the National Academy of Sciences fine seas are rising at the fastest rate in the last 2,800 years. Roughly three-quarters of the tidal flood days now occurring in towns along the U.S. East Coast would not be happening in the absence of the rise in the sea level caused by human emissions. Peter Mondavi, Napa Valley wine pioneer and innovator, dies at 101. The first in Napa to introduce French oak barrels for wine aging, in 1963, and the first to employ cold sterile filtration to prevent wine spoilage. His work with cold fermentation made it possible for Napa vintners to produce crisp white wines that wouldn’t oxidize. His acquisition of 800 acres of vineyard land in the 1960s and 1970s helped to usher in a new standard for estate-grown wines in Napa. He was among the first to recognize Napa’s Carneros region — formerly dominated by dairy cows — as a prime spot for Pinot Noir and Chardonnay. FBI wants data access to an American terrorist's cellphone. Apple refuses on 4th and 5th Amendment grounds. Whereas restaurants, in general, have only a 40% success rate after three or years of operation, brewpubs see a 54% success rate. Smaller brewpubs (fewer than 1,000 barrels) derived 26.8 percent of their sales from house beers, and larger brewpubs (more than 1,000 barrels) derived 46.3 percent of their sales from house beers. Roughly a third of sales stems from a product that averages gross margins that can reach more than $800 per barrel depending on the business model and beer style. —Via Bart Watson, economist for [U.S.] Brewers Association. Craft drinkers are more likely to try new products than Budweiser drinkers. If the competition grows at a 10% clip per year and drinkers have no loyalty to any brands, this is a recipe for market share losses. Anheuser-Busch InBev completes its purchase of Goose Island Brewing's properties begun in 2011, purchases the brewery's original brewpub. A study at Southampton University in the U.K. study finds that drinking two additional cups of coffee a day is linked to a 44 percent lower risk of developing liver cirrhosis. The Food and Drug Aministration (FDA) reverses course, grants GRAS (generally recognized as safe) status to the use of vegetable ash in cheese, and defacto allows raw milk cheese, by pausing its aggressive testing. Both practices are traditional methods of cheese-making. —Via Janet Fletcher's Planet Cheese. Brewer’s yeasts (Saccharomyces cerevisiae) survive the cold of winter, in part, by hibernating and mating inside the intestines of wasps. The gut environment could propagate hybrid strains that wouldn’t otherwise occur, say researchers at University of Florence in Italy. Craft beer drinkers acting childishly at limited-beer releases, creating disturbances. Say it ain't so! In the first 'craft' beer deal of 2016, Victory Brewing Company (of Pennsylvania) is merging with Southern Tier (of New York) and a private venture firm to form Artisanal Brewing Ventures. Boutros Boutros-Ghali, Egyptian diplomat who helped negotiate peace deal with Israel, and was the first United Nations secretary general from the African continent (during the early 1990s), has died at age 93. 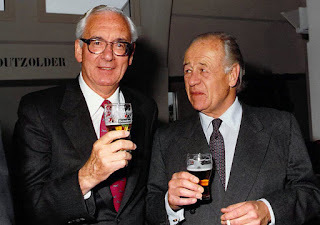 Leo Van Munching Jr., left, with Alfred Heineken. Leo Van Munching, a pioneer of U.S. beer importing, has died at 89. Van munching oversaw Heineken's rise to “America's No. 1-selling imported beer, ” by the 1980s. How British public health authorities manipulated the facts about moderate alcohol consumption versus abstinence. 34 prospective epidemiological studies collected data on how much people drank over a period of years with a view to seeing if they die and what they died of. The risk of death declines substantially at low levels of alcohol consumption and then rises, but it does not reach the level of a teetotaller until the person is consuming somewhere between 40 and 60 grams of alcohol a day, which is to say between 35 and 50 units a week. approximately $120,000 to pay kickbacks to 12 retail licensees throughout the Boston area, and went to great lengths to hide its knowingly unlawful conduct. The commission suspends the distributor's business license for 90 days, and also charges five bars with violating pay-to-play regulations for improperly accepting payments. The Small Brewers Caucus of the United States House of Representatives has asked the Justice Department to review Anheuser-Busch InBev's "massive merger" with SABMiller, and expresses concerns about the merger’s potentially damaging effects on small and independent brewers. The House Small Brewers Caucus primary concern is ABI’s increased leverage on all aspects of the U.S. beer industry, particularly distribution. If the merger proceeds, the combined new company would represent 58 percent of global beer profits. The deal would make ABI the major supplier to independent distributors. If ABI were to pressure independent distributors to abandon the distribution of non-ABI brands—including a significant number of craft brands—those brewers will have only one viable distribution option in those markets, further limiting many U.S. markets that are currently only served by two major beer distributors. Small brewers also fear that the ABI acquisition of SABMiller would affect the pricing and availability of supplies needed to make their product, such as hops and barley. The Washington Nationals baseball team has booted MillerCoors as beer supplier for its ballpark; gives contract to Anheuser-Busch InBev. Carts offering locally-brewed beers —District Drafts— expected to remain. 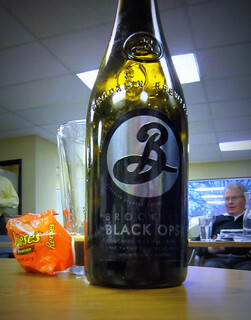 An obligatory beer-with-chocolate photo for Valentines Day.